Pedals for Progress has recently concentrated its activities on sustainable partnerships. These are organizations are able to cover the shipping costs from the U.S.A. to country of destination, the most critical factor in creating a sustainable self financing partnership. It currently considers seven partnerships as “sustainable”, five in Central America, one in the Caribbean and one in Africa. 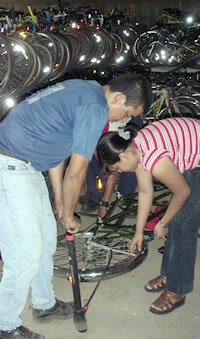 CESTA in El Salvador is the organization that has received most bicycles over the years. PfP is hopeful that other partner organizations, including several that did not receive bikes during the current year, will enter onto the team of sustainable partnerships. For Pedals for Progress, shipping costs from the U.S.A. to country of destination is the most critical factor in creating a sustainable self financing partnership. It currently considers seven partnerships as “sustainable”, i.e., recipient organizations capable of paying for successive shipments over three or more consecutive years. Experience has shown that when shipping costs are below $10 per bike, with good management, the costs are low enough to sustain a self financing partnership. Hence, without charitable donations, grants or other funding, Pedals for Progress is limited to working primarily in Central America, Eastern Europe and the Caribbean. In 2004 there was a reduction in sustainable partnerships from eight to seven. 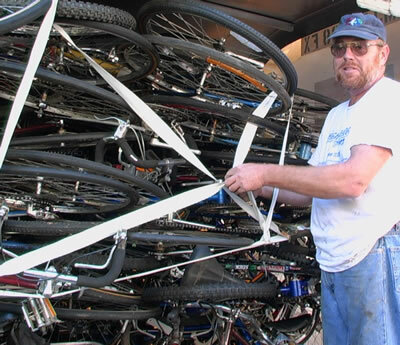 Still, PfP is hopeful that other partner organizations, including several that did not receive bikes during the current year, will pay all or most expenses for new shipments during the coming year. Edikanfo Progressive Foundation, Kumasi, Ghana, is a rural development programa in the northwestern region of the country, which provide transportation to teachers, students, farmers and small entrepreneurs.